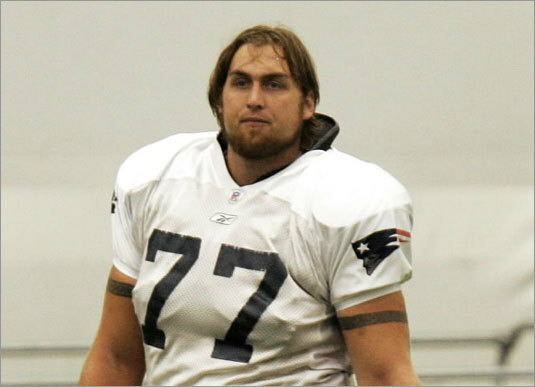 Starting New England Patriots offensive lineman Nicholas Kaczur was arrested in April on a charge of illegal possession of prescription painkillers and then secretly cooperated with the federal Drug Enforcement Administration in a sting operation that resulted in the indictment of his alleged drug supplier, according to a lawyer and two people briefed on the investigation. Kaczur - a 28-year-old, 315-pound offensive tackle - wore a hidden recording device during three different drug transactions in May at gas stations in Foxborough and North Attleborough and a supermarket parking lot in Sharon, according to the lawyer, the two people, and federal court documents. At each of the three transactions, Kaczur paid $3,900 in cash to buy 100 OxyContin pills, a potent prescription pain reliever. Federal agents arrested the alleged dealer, Daniel Ekasala, moments after the third transaction with Kaczur, said Ekasala's lawyer. He was indicted by a federal grand jury yesterday on three counts of possession of oxycodone (the main ingredient in the prescription drug OxyContin) with intent to distribute. He is due to be arraigned today in federal court. Kaczur, approached yesterday afternoon by a Globe reporter as he stood on the front porch of his Attleboro home, denied participating in a DEA investigation or buying drugs. He also said he was not familiar with Ekasala. "I don't know what you're talking about, bro," Kaczur said repeatedly, in response to questions about the investigation. "I don't know where this is coming from. I don't know what you are talking about." When asked if he was still playing for the Patriots, Kaczur, whose salary is listed at just under than $1.4 million this year, said, "Yeah." The sting operation is detailed in a six-page affidavit filed by a DEA special agent in US District Court in Boston. That document makes constant reference to an unnamed cooperating witness, a buyer who was reaching out to the alleged dealer by text message, then meeting with the dealer to exchange cash for drugs. After Ekasala was indicted yesterday morning, Ekasala's lawyer, Bernard Grossberg of Boston, acknowledged that Kaczur was the cooperating witness in the case. Two other people briefed on the investigation, speaking on the condition of anonymity, also verified that Kaczur was the cooperating witness in the DEA's case. If the case proceeds to trial, Kaczur would probably be required to testify. Ekasala, Grossberg said yesterday, has himself been asked to cooperate by federal agents, but he has repeatedly rejected their proposal. "He is not cooperating," Grossberg said. The attorney added that Ekasala was "an extremely reluctant participant and was somewhat enamored of being friendly with or having contact with a professional athlete." Grossberg said that, according to DEA documents presented to him before the indictment, Kaczur said he had begun buying OxyContin in November 2007 and purchased 100 pills every few days, paying tens of thousands of dollars over time. "My client was always sympathetic to Mr. Kaczur and suggested to him many times, as the text messages will show, that Kaczur ought not to be doing what he was doing," Grossberg said. "Professional athletes in this country are treated like royalty, and royalty sometimes abuses the people they come in contact with, and I think that's what happened to Ekasala." Kaczur's previously unreported arrest on drug possession charges, and his role in a DEA investigation, will mark the latest controversy to be faced by the New England Patriots, who suffered an upset defeat in Super Bowl XLII this year, ruining the team's bid for a perfect and unprecedented 19-0 record. The team was penalized at the beginning of the 2007 season for illegally taping hand signals of opponents' defensive coaches. In addition, defensive star Rodney Harrison was suspended for four games during the season for using human growth hormone. A Patriots spokesman, Stacey James, declined to comment on Kaczur yesterday, saying, "We're deferring all questions on this matter to the appropriate law enforcement officials." His brief remark left it unclear whether the Patriots were aware of Kaczur's arrest and his role in a federal drug case. He said Kaczur remains a member of the team. The Patriots added another offensive lineman to the team Monday, free agent Oliver Ross, who is expected to play right tackle, Kaczur's position. Vance Malinovic, Kaczur's agent, said last night that he was not prepared to talk about Kaczur's situation. "Right now, I have no comment," he said. An NFL spokesman, Greg Aiello, said last night that misusing prescription drugs is a violation of the league's substance-abuse policies and that players face escalating sanctions for repeated violations. Aiello declined to speak directly to the case involving Kaczur. "It's a law enforcement matter, and any questions should be directed to the appropriate law enforcement agencies," he said. Assistant US Attorney Brian T. Kelly declined to comment yesterday on the investigation or Kaczur's role as a cooperating witness, but reacted to Grossberg's suggestion that Kaczur's star power pulled a reluctant Ekasala into the drug business. "The crazy fan defense doesn't seem real plausible, but it will be up to a jury to decide," Kelly said. Kaczur, who was drafted by the Patriots in the third round in 2005 and started 15 games last year, began cooperating shortly after he was arrested the morning of April 27 in New York by State Police who stopped him for speeding and found a small amount of oxycodone in his car, authorities said. Kaczur was driving 76 miles an hour in a 65-mile-per-hour zone on the New York State Thruway in Whitestown when police pulled him over and discovered a "small amount of controlled substance for which he did not have a prescription," according to New York State Police Sergeant Kern Swoboda. The trooper identified the substance as oxycodone and said Kaczur was charged with criminal possession of a controlled substance in the seventh degree, which is a misdemeanor. According to the records filed in federal court, the first transaction that the DEA orchestrated between Kaczur and Ekasala occurred May 1. It was for 100 OxyContin pills, at a cost of $3,900. That was followed by another transaction on May 6 for the same number of pills and then the final one on May 13. Unbeknownst to Ekasala, the affidavits said, Kaczur was wearing a recording device, and their words and movements were monitored by DEA agents. Kaczur has told authorities that he had been buying oxycodone from Ekasala every few days in batches of a hundred since November 2007, the middle of the Patriots season, according to Grossberg, who said that information is contained in DEA reports. That time frame would include the Patriots' playoff run and their 2008 Super Bowl appearance. But, Grossberg accused Kaczur of "puffery," insisting he was inflating the amount of drugs he bought to make it seem as if he had more to offer authorities and get himself out of any legal trouble. Grossberg described his client as a young, middle-class father of twins. Kaczur - a native of Brantford, Ontario - worked construction for two years after high school and in 2001 earned a scholarship to the University of Toledo, where he became the first four-time, All-Mid American Conference player in school history. Dr. Alex Stalcup, a Lafayette, Calif., doctor who says he is treating current and former NFL players for chronic pain issues, said that using powerful pain-killers can help players get through one more Sunday, but at a terrible risk to themselves and their futures. "If your pain is so great you just can't move your muscles and you're just absolutely in agony and you have to play today, you can take an opiate that will prevent the pain." he said in a phone interview. ". . . But you will pay a high price for it."